Synopsis (Goodreads): Set in an imagined future England that has given itself over to fascism, this groundbreaking story captures both the suffocating nature of life in an authoritarian police state and the redemptive power of the human spirit which rebels against it. 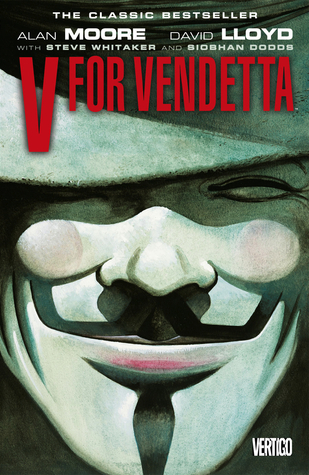 Crafted with sterling clarity and intelligence, V for Vendettabrings an unequaled depth of characterization and verisimilitude to its unflinching account of oppression and resistance. The plot of the graphic novel has great potential, which I feel didn’t came out in the novel. The plot felt too difficult too explain with a graphic novel. I feel it could have been told in a better way if it was a book. The story of V and the Hand are complex and it didn’t come to right with the graphics and story told in the grapic novel. The characters of this book were hard to understand. We got V and Evey, but besides them I couldn’t tell anyone apart. V came over as an intelligent and dedicated person, whereas Evey sounded as a girl with little wits and whimsical. The rest of the characters were very hard for me to keep apart. These consisted mostly of people that worked for The Hand and the police. They all looked the same to me. The drawing style of the graphic novel wasn’t working for me. The drawings were often too dark and the emotional expressions were sometimes far-fetched. The story was hard to understand through the drawings that lacked in explaining me what was going on. Even though the graphic novel has more 300 pages, I was feeling like the amount of pages was too little to have a good understanding of the story. On the other side, the amount of pages felt like too many to stay well interested in the graphic novel. Also the characters weren’t distinctive enough in the drawings for me to know which character I was looking at. I gave this graphic novel 2/5 stars. Why not 1 star? Because the idea of the graphic novel is really great, which is greatly shown in the amazing movie based on this graphic novel.